Hollywood, 1959: Alfred Hitchcock and his wife, Alma Reville, are debating what film will be the heir to the success of their latest picture, North By Northwest. Alma (Mirren) thinks they should adapt a piece from her dear friend Whitfield Cooke (Huston). Alfred (Hopkins) hasn’t a clue what to follow up with, as long as it’s not that very piece Alma’s friend has submitted. Through luck, timing, and a contractual obligation with Paramount for one last film, Hitch would find himself making a film that seemed at multiple points in its lifespan to be doomed to failure. A little film based off of a salacious novel, inspired by real life atrocities, and serving as the obsession of Mr. Hitchcock’s fevered psyche: Psycho. Hitchcock isn’t a complete love letter or poison penned memoir of the genius at the center of it. If anything, Psycho is the subject of the love fest. From the killings of Ed Gein’s design that inspired the book to the publication and discovery of said novel, all the way to limited two city premiere of the film, the journey to make Psycho is shown as the less than perfect road it actually was. Yet for every person that stood in the way of the film’s completion, there were at least two more that believed in the cause. As easy as it seemed for Psycho to be derailed, it seemed even easier to keep it going until completion. 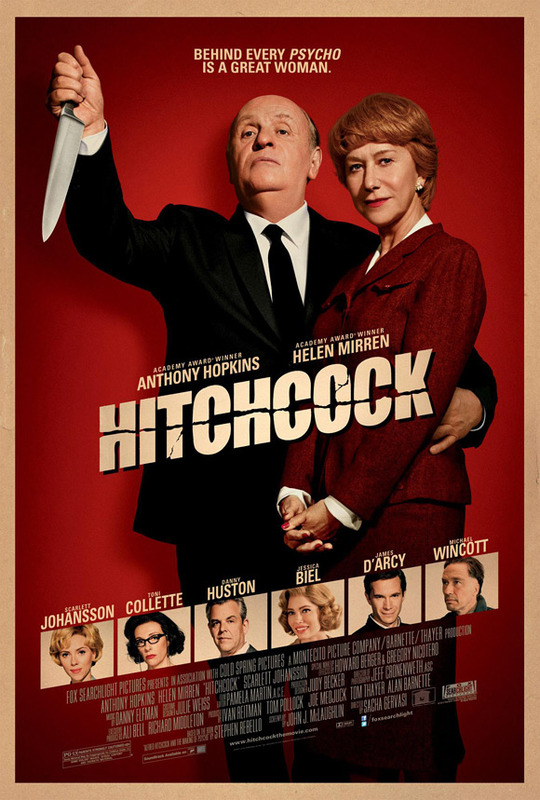 It’s almost as if the film was destined to be a classic, and it’s a pity that Hitchcock couldn’t seem to follow along its projected destiny and garner not only some awards buzz but also just a general buzz among the public. At times loose and funny, and at times sad and serious, the film treats the history it presents with due respect but without the stuffiness some historical pictures would engage in. In the end, it’s not a life’s battle to make Psycho, and it’s not treated as Hitchcock’s most important film. Instead, the battle to make Psycho is shown as a battle for Hitchcock to keep the momentum his career and his life had achieved at that time. It is a battle to stay relevant and to stay creatively interested in his own career, instead of selling out to that Ian Fleming picture they’re offering him. Hitchcock treats Psycho not as the the film that made its subject’s career, but as the film that kept his career going. As with every entry here at #TakeOutTheater, we pair a film of good taste with a drink of equally excellent taste. This one is a homegrown combo from a random corner of the blogosphere, paying tribute to a critical ingredient to a preponderance of Mr. Hitchcock’s films. You see, in most of his films there’s a lead female character, a woman cut from a particular cloth. Cool, independent, and ambiguously dangerous; she leads the hero on a wild goose chase of the heart, as he winds his way through the narrowing maze of reality. In the end, it can either turn out beautifully (just ask Roger Thornhill of North By Northwest fame) or not (Vertigo’s John “Scottie” Ferguson knows a thing or two about this side of the coin.) Either way, this type of woman is what now refer to as the “Hitchcock Blonde” is equal parts sweet and strong, with a heavy dose of mystery about her. It is in that spirit that we introduce to you a sounds perfect for those same-said women and the men who are as eternally drawn to them as Hitch himself. Thanks to Mandi over at Here’s Looking At Me Kid for this rather inspired drink recipe, and as usual thanks to all of you for coming back for another installment of #TakeOutTheater! Got any suggestions for film and drink pairings? Send ‘em our way through the Comments below, our Facebook/Twitter pages, or just email us. We’ll see you again next week!